The empty room should be anathema to game making. Having a space that serves no tangible purpose, hides no skill or item or confrontation meant to either empower or enrich the experience—by rights, it should be considered a waste of time and effort. Cultivating atmosphere can metastasize into confusion and even boredom at the drop of a hat. If your player doesn’t understand why they’re in your dank dead-end cave or barren room with nothing but a creepily gesturing mannequin in the corner, you risk losing them in the story or the flow of the action. Under the right circumstances, though, the empty room can be a deeply moving space, an opportunity to fill a game with implicit history and time and soul. Passages between destinations or even a space where you stop to reflect, the empty room can fundamentally change the shape of a game from a mechanical playground to a living world. The original Legend Of Zelda gained a mythic quality thanks in part to its abundance of empty rooms. The center of Hyrule is densely packed with secret passages hiding under bushes and statues, which makes it a fitting starting point for Link’s journey. Diligently exploring this region teaches you that you’ll need items like bombs and the fire-spreading candle to reach new locales. Almost every screen in the immediate area has something to do. Go east, and there’s a bush hiding a potion shop. Go west, and there’s a gambling den. To the northeast, there’s a guy who will take 20 rupees from you for burning down his front door; northwest, a shop to buy a candle to do the burning. But the more you travel outward, the more Link runs across chunks of land with nothing in them but angry animals. Removed from the safety of that starting zone, this world starts to feel less like a place where you’re always guaranteed to find something good. Hyrule expresses the same indifference to your being there as a stretch of wilderness with no cell reception or clearly posted trails. The compulsion to burn every bush and bomb every wall gives way to a more attentive style of play. Living in Hyrule and going about your quest in a natural way is far more important than trying to game the system and maximize your experience with every tool and secret. The southwestern portion of Hyrule, home of the Lost Woods, is the most powerful, empty space in the game. Trundle in without knowing the correct path through the forest and Link will find himself in a loop, exiting and reentering the same screen again and again. Before he can move on, he has to visit the southwestern-most corner of Hyrule to meet an old woman who cryptically explains how to traverse the woods. Once you solve the mystery and get to the other side, there’s just a blank space with six of the game’s most challenging enemies wandering a wooded clearing. There’s nothing there but a fight to avoid. It’s easy to leave again, either south to the Lost Woods or north to a cemetery whose six-screen sprawl is made up entirely of identical gravestones and murderous ghosts. There’s a sword waiting in one unmarked grave, but the rest of it is empty. Why is there a cemetery so far away from where anyone lives? Why would the safest path to get there be through a cursed forest that can have you walking in circles until you die? And in a section of the map that’s 12 screens total—almost 10 percent of the entire overworld—why would seven of them be devoid of anything but pissed-off centaurs and man-eating plants? The absence of activity in these 12 screens raises more questions than the eight underground dungeons that make up the bulk of Zelda. Those exist to protect precious weapons and pieces of the mystical Triforce; the cemetery and the Lost Woods exist because this used to be a place where people lived. Something happened—bad or good or neither—and no one lives there anymore except a lady who can tell you how to pass through. Eleven years later, Castlevania: Symphony Of The Night did in a single screen what The Legend Of Zelda did in 12. The beloved goth-glam fantasia that transformed Konami’s B-horror homage into a series that’s more about exploration than action is notorious for its cheesy story. Its characters don’t speak much, but it’s hard to forget the times they do. Like an unbearably earnest community theater troupe in a Kevin Smith production of Hamlet, every hammy line is simultaneously stilted and booming. Its scenes never feel as rich with gothic romance as its barely told story of Dracula, his human lover, and their haunted half-vampire son wants to be. That is, until you find the chapel in Dracula’s castle, a room that serves absolutely no purpose but to create an unexpected well of implied loss. The Royal Chapel is one of Symphony’s most beautiful areas. It’s divided into three main sections: a towering stairwell full of stained glass windows; an enormous room comprising a richly detailed apse, chancel, and pews; and a bell tower patrolled by birds, ghost swordswomen, and flying skeletons. Just beyond the pews at the base of the bell tower is a room containing nothing but a confessional. There’s no need to go in. It doesn’t hide any of the relics Alucard, Dracula’s son and the game’s tortured hero, requires to reach the castle’s innermost chambers or confront his father. Enter it, and the tenor of the game changes. The sweeping orchestral music gives way to an ambient dirge that’s as meditative as it is disturbing. Alucard can sit on either side of the booth. If he chooses the seat of the confessor, one of two phantom priests appears—one quietly blesses him and may leave behind some wine; the other draws the confessional curtain and stabs him. He can also take over the priest’s position and receive confession from a weeping woman dressed to the 19th century nines or get stabbed by a sinister penitent spirit. This chapel quietly hints at so much about the Castlevania series’ version of Dracula and his partly human family. At the beginning of the game, he sneers that religion enslaves humanity, so why would the supernatural castle that reflects his chaotic power house a beautiful Catholic church and confessional? 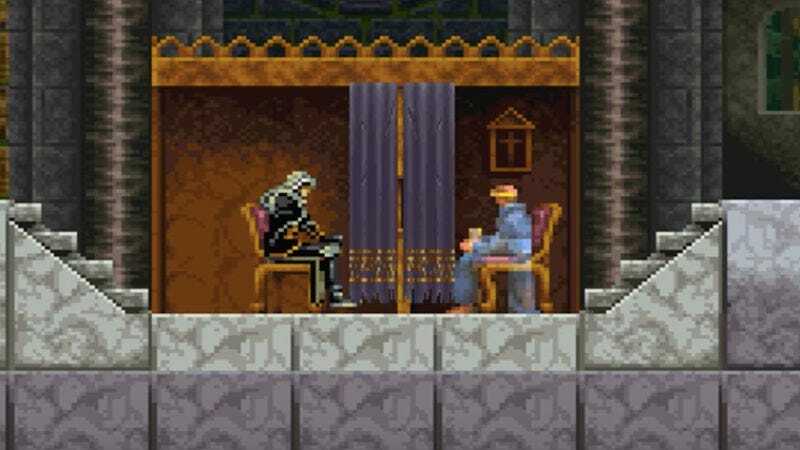 Thanks to the game’s opening narration, we know Alucard’s hidden himself away for centuries, afraid that he’d hurt someone, so it makes some sense that he’d seek out benediction, but the sacrament of wine he can receive (its bestowment from the ghost priest isn’t guaranteed) does nothing to physically change him. His confession doesn’t fix him or assuage his fears. And who is the weeping woman seeking forgiveness in the chapel? We know thanks to a nightmare flashback and the game’s ending that Dracula loved Alucard’s human mother, and she in turn wanted Alucard to forgive his father and the humans that burned her at the stake. Is this an echo of her confessing her love for a monster or just another person that passed through the castle chapel, haunted by something else entirely? The mawkish nonsense of Sypmhony’s explicit story gains some poignancy in a single room that does nothing to change the way the game is played. The confessional gives characters with the depth of figures on a Megadeath tour-bus mural weight and dimension that all the cutscenes and fan-fiction in the land can’t provide. Under the most pragmatic eye, the confessional in Symphony Of The Night and that centaur-filled passage between Zelda’s cemetery and Lost Woods would be totally removed. Judging by those games’ sequels, that’s the lesson the designers learned. The Zelda games born in the wake of 1991’s A Link To The Past are densely laid out and include open areas to travel through, but there are almost no spaces that serve only to enhance the world’s character. Even amazing moments like the Temple Of The Wind Fish in Link’s Awakening lead to yet another key to yet another dungeon. Symphony Of The Night co-director and producer Koji Igarashi made five more exploration-based Castlevania games, but none of them featured anything like the confessional. Bizarre one-off moments in those games are converted into explicit missions with rewards, like Dawn Of Sorrow’s monster hunts. Tracking a unique moth-man monster is good fun, but it’s not haunting like a ghost confession soaked in unknowable meaning. That’s what a game gains from the risk of including a space that doesn’t serve a purpose: a tangible place can become haunted, a world with spirits rather than tasks.